Ivy on windowsills, wild flowers in vases scattered on dining tables, rose petals dusting the aisle... The possibilities for using flowers & foliage at a fforest wedding are endless, and we thought we'd seen it all! ...Until Forbesfield flower school introduced us to a concept that we'd never seen before in our 10 years of fforest weddings... flower bombs! When Forbesfield came to fforest in the Autumn, they had something new and exciting to show us. Using the cedar barn as a backdrop, they showed us how to create an explosion of flowers & foliage to hang from the ceiling. A beautifully eye-catching, dramatic way to decorate a wedding space, with endless options in terms of design and aesthetic. We decided that these flower bombs would look the best over-head during the wedding feast, as a sort of chandelier of flowers. As you can see by the photos, the finished product is quite impressive. At the end of October FFS dusted off our cosy jumpers and muddy boots, hopped in our van and headed way down West to host a workshop at the wonderful Fforest. If you aren't familiar with Fforest you will not know that it is the most inspiring place run by the warmest and most engaging people. At it's most basic it's a place to camp and live off the land; it's a place to live the simple life. At it's most wonderful, Fforest is a place to relax, unwind and feel the nostalgia of childhood camping and the magic of it's idyllic setting. Fforest has many strings to it's bow, with weddings being one of a number of events that they host, so our first introduction was a few years back when we had a mutual bride who was getting hitched there. So off we went black-sky-early one Monday morning, driving through the rain and mist of the Welshest of weather days, but as we've said, magic happens at Fforest and and so by the time we arrived the mist had cleared, the sun was up and and our students were waiting and a few little four legged friends also joined us to our absolute delight. These ladies were brilliant; and we laughed a lot! They all had the makings of wonderful floral designers, creating wild and elegant hand-tieds and hanging installs like they were born to it using a mix of Dutch and Welsh foraged treasures. To watch what flowers and foliages each person selects, watch them build a design and see the cogs turning as they figure it out is by far the thing we love most about teaching and easily the most fulfilling. We can't wait to return and create again at Fforest very, very soon. With their fragile and delicate perfection, beauty, colour and fragrant scent, flowers hold such delight and a special place in our emotions. They can trigger happiness and satisfaction. I have many joyful memories as a little girl always picking flowers. Putting together little posies to give to grandma, making rose petal perfume with my sister and daisy chains to wear on our heads. I can't remembering not always loving flowers. I tend to give preference to the wild ones that hide amongst the hedgerows and on the side of the footpath, the ones that many may even call weeds: tall teezle, rose campion, wild carrot, meadow sweet, knapweed and buttercup. When we set up fforest it made sense and was important to me to welcome our guests with flowers when they arrived. Flowers bursting with seasonal colour, light and the scent of the surrounding fields and our garden. So many occasions are celebrated with flowers: birthdays, weddings, congratulations, I love yous, thank yous, I'm sorrys...Flowers so frail and fleeting hold an amazing power, energy and positivity. Arriving at fforest for your holiday, event or wedding is something to celebrate with some simple flowers, a welcoming sight for people who appreciate nature and relish the bounty of the changing seasons. An ever-changing colourful display of leaf, flower, fruit and berry across the garden, hedgerow and fields. 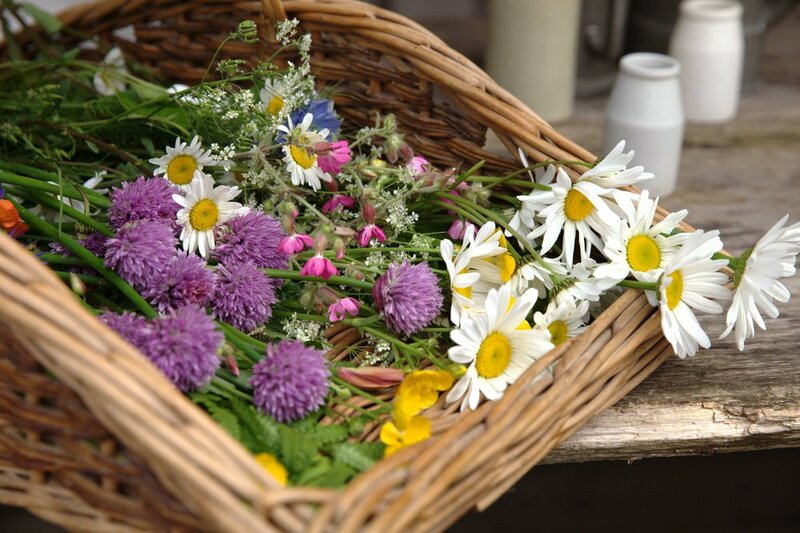 On arrival day, a lovely task is to walk the fields and garden, in-between the fruits, herbs and vegetables in the raised beds of the polytunnel, to pick a big basket full of flowers. 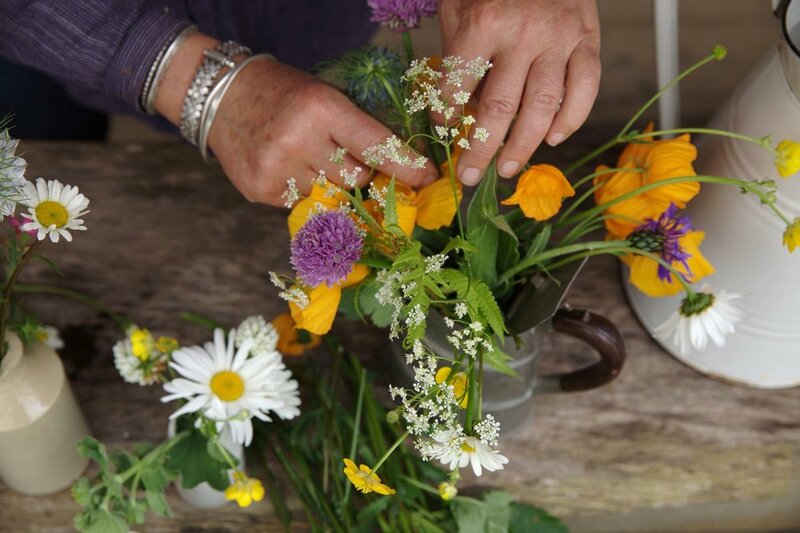 These we arrange in the many pots, jugs and jars we've collected over the years at fforest. We present our little posies; flowers and foliage full of beauty, fragrance, frailty and folklore, and we hope that you appreciate them as much as we do. I am very much a pick and plonk in the pot flower arranger. One thing I have observed and learnt over the years of fforest flower arranging is how the beautiful greenery that surrounds flowers is just as important. So much variation in texture and pattern, highlighting the pops of colour.